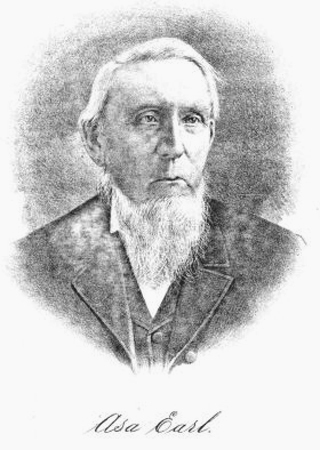 ASA EARL, retired farmer, Wayne Township, was born in Onondaga County, New York, August 28, 1804, a son of NEHEMIAH and REBECCA (DANFORTH) EARL. The father of our subject was a son of NEHEMIAH EARL, a native of Nova Scotia, who made his escape from that country during the war of the Revolution, going to Massachusetts, where he and his three sons served in the Colonial army through the entire war, after which he settled in Onondaga County, New York. The mother of our subject was a daughter of ASA DANFORTH, a native of Massachusetts, and the first white settler of Onondaga County, New York. He served as a Captain through the Revolutionary war. To the parents of our subject fifteen children were born, of whom fourteen grew to maturity, and of this large number but four are now living--ASA, the subject of this sketch, who was the sixth child; DANIEL, of Madison County, Iowa; NEHEMIAH, living on No Mans Land in the West, and ADAMS, of Tippecanoe County. ASA EARL, whose name heads this sketch, was reared to agricultural pursuits, his father being a farmer by occupation. He remained in his native county until February 1, 1814, when the family immigrated to Ohio, locating first in Muskingum County, and two years later settled in Fairfield County. They subsequently moved to Wyandotte County, where the father died in 1839, aged sixty-seven years. His widow died in Tippecanoe County, in 1843, at the age of sixty seven years. ASA EARL is one of the early pioneers of Tippecanoe County, coming here in September, 1832, from La Grange County, Indiana, whence he had come from Ohio, in the year 1831. On coming to Tippecanoe County he first rented a farm in Wayne Township, and shortly after purchased a tract of 500 acres located in Wayne and Shelby townships, of which seventy-five acres was partially improved, giving for this land his note for $2,000. He immediately began making improvements on his land, and three years later he purchased an additional 160 acres, and here he has since made his home, living on the same land for a period of twenty-nine years. In connection with his farming pursuits he has also dealt extensively in grain in which he has been highly successful, and has now a competence for his declining years. MR. EARL has been three times married, his first marriage taking place December 25, 1829, to MISS ISABELLA SHANNON, of Kentucky, who died in the spring of 1840. Six children were born to this union, of whom on one survives--SALIMA, who is now the wife of JACOB MARKLE, of Marion County, Iowa. One son, AUGUSTUS, died February 27, 1881, at the age of forty-eight years. For his second wife MR. EARL married LYDIA RUPE, a native of Pennsylvania, who died a year and a half after her marriage. MR. EARL was a third time married June 13, 1850, to MISS ELIZABETH YOUEL, a native of Virginia, and a daughter of JOHN and NANCY (McKNIGHT) YOUEL. When a child she was taken by her parents to Franklin County, Ohio, where she was reared to womanhood. MRS. EARL is a member of the Presbyterian church. Politically MR. EARL affiliated with the Republican party.